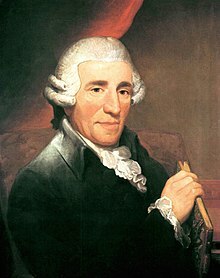 (Franz) Joseph Haydn[n 1] (/ˈdʒoʊzəf ˈhaɪdən/; German: [ˈjoːzɛf ˈhaɪdən] ( listen); 31 Mairch[n 2] 1732 – 31 Mey 1809) wis an Austrick componer o the Clessical period. He wis instrumental in the development o chamber muisic sic as the piano trio an his contreibutions tae muisical form hae earned him the epithets "Faither o the Symphony" an "Faither o the String Quartet". Haydn spent much o his career as a coort muisicker for the wealthy Esterházy faimily at thair remote estate. Till the later pairt o his life, this isolatit him frae ither componers an trends in muisic sae that he wis, as he put it, "forced tae acome oreeginal". [n 3] Yet his muisic circulatit widely an for much o his career he wis the maist celebratit componer in Europe. He wis a friend an mentor o Mozart, a teacher o Beethoven, an the aulder brither o componer Michael Haydn. ↑ See Haydn's name. "Franz" wisna uised during Haydn's lifetime an is avoidit bi scholars the day ("Haydn, Joseph" bi James Webster in Grove Music Online, accessed 18 Januar 2007). ↑ The date is uncertain. Haydn tauld ithers he wis born on this day (Geiringer (1982, 9); Jones (1810, 8)), but some o his faimily members reportit 1 Aprile instead (Geiringer). The difficulty arises frae the fact that in Haydn's day offeecial records recordit nae the birth date but the date o baptism, which, in Haydn's case, wis 1 Aprile (Wyn Jones 2009, p. 2–3). ↑ Haydn made the remerk tae his friend an biografer Georg August Griesinger; citit frae Inglis version bi Vernon Gotwals (Griesinger 1963:17). ↑ For date o portrait see Jones2009a, p. vi. This page wis last eeditit on 19 November 2017, at 02:13.